Heat oven to 400°F. Line large cookie sheet with parchment paper. In small bowl, mix egg white and water until foamy; set aside. In food processor, process shrimp, carrot and onion until finely chopped. In medium bowl, mix shrimp mixture and all remaining pot sticker ingredients except biscuits with fork until well blended. Separate dough into 10 biscuits; separate each evenly into 2 layers, making 20 biscuit rounds. Press or roll each into 3 1/2-inch dough round. Place 1 rounded teaspoon shrimp filling in a line about 1/2 inch up from bottom of each dough round. For each pot sticker, bring sides of dough round up slightly over filling; bring bottom edge of dough up over filling. Brush top edge with egg white mixture; continue rolling up to seal. Place sealed side down on paper-lined cookie sheet. Brush rolls with remaining egg mixture. Bake at 400°F. for 10 to 14 minutes or until golden brown. Meanwhile, in small bowl, mix dipping sauce ingredients with wire whisk or fork. 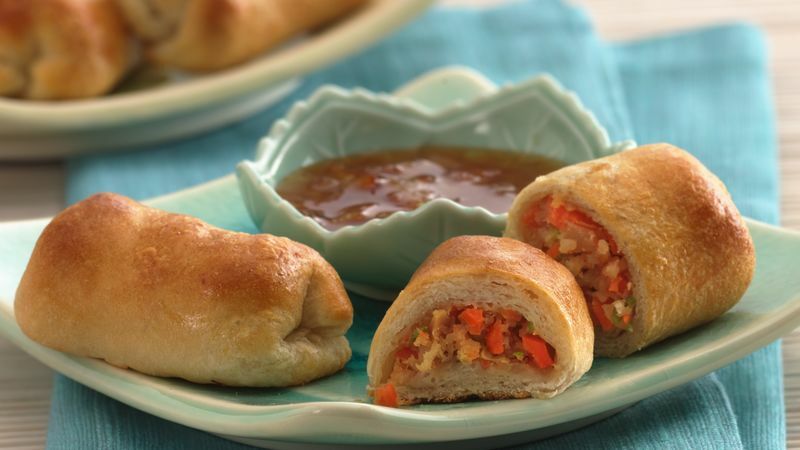 Serve warm pot stickers with dipping sauce.